ANS is committed to improving public health care through the provision of high-quality continuing medical education to our members. Scientific symposia, delivered twice per year at national venues, showcasing the latest research in the field and featuring national and international experts on related clinical topics. Study groups & mini-seminars offered at the Annual Meeting of the American Academy of Otolaryngology - Head and Neck Surgery. The Otology & Neurotology Journal provides an additional vehicle for further collaboration and dissemination of new information, science and standards of care. To actively promote research, the American Neurotology Society launched a fundraising effort in honor of our 50th anniversary to establish an unrestricted research endowment. Our expectation is that over time, the endowment will continue to grow and play a pivotal role in directing and supporting research in our field. 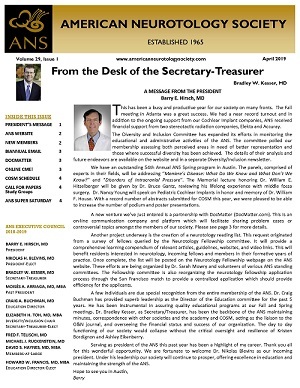 Please consider the American Neurotology Society in your philanthropic endeavors and estate planning. The House-Hitselberger Lifetime Achievement Award was presented to nine neurotologists. The award honors the legacy of two giants in the field of neurotology, Dr. William F. House and Dr. William E. Hitselberger, and recognizes those individuals who have demonstrated "superb surgical skills and patient care, a commitment toward education and cumulative scientific contributions that have profoundly impacted the field of neurotology".